Review A more focused variation on the pointless ill-fated Palm Foleo, the Redfly attempts to bring laptop/netbook usability to the humble Windows smartphone. The first thing that strikes you about the Redfly is the quality, it is a very well constructed and a nice looking bit of kit. Measuring 2.5 x 15.2 x 23cm and weighing 0.9kg, it resembles a fashion-conscious netbook, the outer casing being covered in a rather unusual, almost soft touch, satin finish and coming in a sedate, but attractive maroon and grey colour scheme. Though only about 75 per cent of the size of a regular laptop keyboard, the Redfly's is a treat to type on. The 25 x 75mm touch pad is also well above par responding smoothly and reliably to the touch, ditto the two touch bars beneath it. 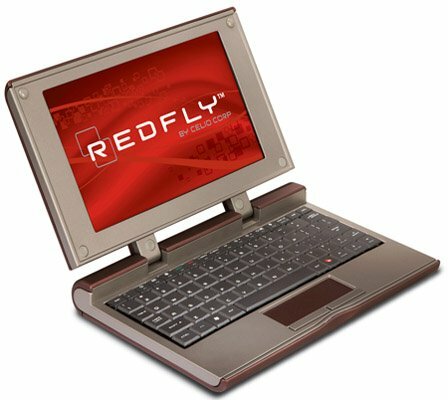 The Redfly has an 8in screen with a resolution of 800 x 400 and while it won't win any awards for video playback, it is bright, clear and sharp and just the job for a hefty spot of word processing. When it has snapped firmly shut the Redfly is a perfect oblong, the two halves of the unit being the same thickness. Round the back external connections are limited to two USB ports, the power jack and a VGA output. Beyond letting you connect a mouse or such the USB ports also allow you to add a USB memory stick to your phone's system as remote storage, which could come in handy.